Providence Industrial Workers of the World | Solidarity Forever! There have been two separate instances of sexual assault, committed by two of our now former members. The first was expelled by vote at our April meeting. This was after he had being found guilty in an IWW charges process by an impartial committee of his peers, and after refusing to make good on the terms laid out by the survivor and the committee. The second was asked to resign in June after we received testimony from the survivor, this was done by the Branch Secretary in accordance with the Sexual Assault Policy detailed below. In addition, due to the connections of the second perpetrator with the property at 375 Smith St, the members of the Providence Branch of the IWW have decided that it will no longer serve as our Union Hall. In an effort to prevent similar things from happening again and in order to be better prepared to handle such matters in the future we have drafted new polices. In March the IWW dedicated time to investigate preventative practices such as consent & anti-harassment training. We welcome any feedback on trainings your group is aware of. At our March meeting we also formed a local iteration of the IWW’s Gender Equity Committee. Our local GEC is composed of a super majority survivors, women, LGBTQ, and non-binary folks with participation of only one male ally. This is not just happenstance but a requirement of the committee’s founding, so policy can be formed by listening to those most directly affected. All members and organizers involved in union activity have been made aware of these policy, and we have welcomed internal and external feedback for their continued improvement. The policies also govern the IWW‘s General Defense Committee and Incarcerated Workers Organizing Committee. You will notice they allow for any member or non-member to submit complaints of interpersonal violence, harassment, or sexual assault. If you or your group has any feedback we welcome it. Come learn the basic skills needed to start building power with your classmates at your school and in your communities! 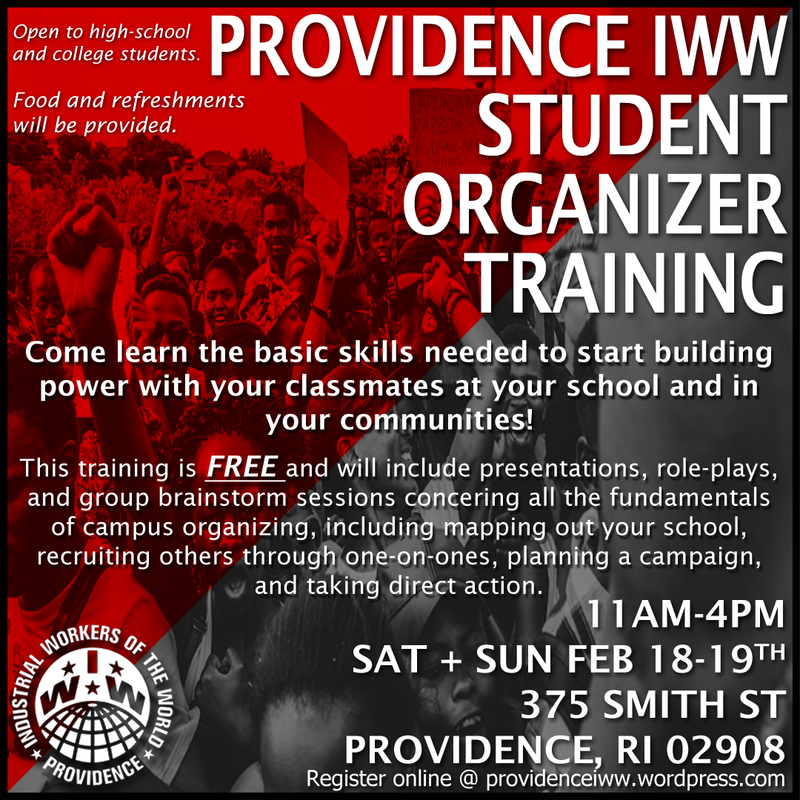 We will be hosting our student organizer training during the weekend of February 18th and 19th from 11-5PM. The training is FREE and will include presentations, role-plays, and group brainstorm sessions concerning all the fundamentals of campus organizing, including mapping out your school, recruiting others through one-on-ones, planning a campaign, and taking direct action. This training is open to both high-school and college students. If you are planning on attending, please fill out the fields below to register. Gathering this information will help us better plan for the training ie. ordering the appropriate amount of food, printing supplies, etc. Although we recognize that students have busy schedules, we encourage participants to commit to the two days of the training because the content covered on the first day will be built upon on the second. We will contact you with more detailed information about the training upon registration. If you are planning on attending, please register at the following link: http://bit.ly/2ghO8sV. Gathering this information will help us better plan for the training ie. ordering the appropriate amount of food, printing supplies, etc. *This training will be run as a pilot session in order to better refine and improve the contents. We are looking for feedback and want to know how we can improve the training. On Dec 10, the scheduled talk by Daryle Lamont Jenkins was cancelled by community members concerned with the IWW and its’ handling of sexual violence. Shortly after, the IWW’s General Defense Committee met to analyze what went wrong, and to develop new procedures to ensure that the missteps of the IWW’s response to a complaint of sexual violence are not repeated. As an immediate form of relief, the GDC proposed the following three measures, which the IWW voted unanimously to adopt. Any individual facing charges of Interpersonal Violence or Harassment (IVH) within the IWW charges system shall be prohibited from attending Union events and activities. A process to ensure reliable notification of the membership and attendees of IWW spaces and events. A total ban on the consumption of alcohol and/or drugs while members are engaged in any union business- including meetings outside the branch, such as with coworkers and community members. These resolutions will only be the first steps taken. The next few weeks will be used to develop additional policies – such as measures to address claims against union officers. Because the knowledge that a process was underway was not clearly conveyed to the rest of the branch, there was a great amount of confusion in the branch and our ability to properly respond to other parties concerned about the situation was hindered. As such, some saw a conspiracy of suppressing the complaint, whereas nothing could have been further from the truth. We are committed to learning from our past mistakes. The new policies are designed such that community members are protected from potentially dangerous persons. However, banishment is not a solution to sexual assault. We are not a carceral organization, and we do not have the capacity to prevent an aggressor from leaving the area for a new, unaware environment. We are committed to ensuring that individuals with complaints of IVH (Interpersonal Violence and Harassment) do not attend our space or our events. However- we have a moral responsibility to follow-up with the accused so they do not simply leave and go elsewhere. Banishment is not a solution to sexual assault. Banishment defers the problem to someone else, and does not bother to do the work to solve it. One of our members has personally seen the results of banishment: More survivors were created, and accountability was delayed for decades. We hope that anyone hurt by a member of our organization, either in the past or in the future, will feel comfortable and safe enough to come forward to us. We are committed to the safety and security of everyone in our union, and anyone our membership comes into contact with. We do not propose to replace other resources for survivors of violence and sexual assault, especially not the judicial system. That being said, we will initiate accountability process for any member accused of IVH and we will strive to promote a culture of personal responsibility and accountability in our union. We can do better. We must do better. union meetings in accord with terms 2,3, and 4.
so as to alternate attendance with the complainant and the survivor. Complainee may attend any union meeting if permission is granted by both. then given in writing to complainee. will not attend any social event the survivor is present for. any appeal has been completed. The complainant will also not publicly publish comment in exchange for agreement to the terms of restituion. If complainee chooses to write anything in any fora about this complaint or any process related to it, complainee will never use the survivor’s name. within 90 days from the date this decision was received by the Providence GMB. to a vote on said motion. A process of accountability for behavior be formed through an outside advocate of transformative justice. Attending a regular monthly meeting with three men which would discuss readings and confronting instances of consent, alcohol abuse, and patriarchal interpersonal dynamics. If the branch finds that there has been real effort at following everything satisfactorily, a safety group will be established to keep track/tabs of complainee and fulfill all additional terms established by the decision. This safety group would be bottomlined by the current branch secretary, is detailed below and butressed by all safety policies previously outlined in the above statement. in GMB activites. The safety plan will also stipulate that complainee will not participate in any IWW events in which alcohol will be served. Complainee will make arrangements for at least one safety plan signer to attend events with them. Come learn the basic skills needed to start building power with your classmates at your school and in your communities! 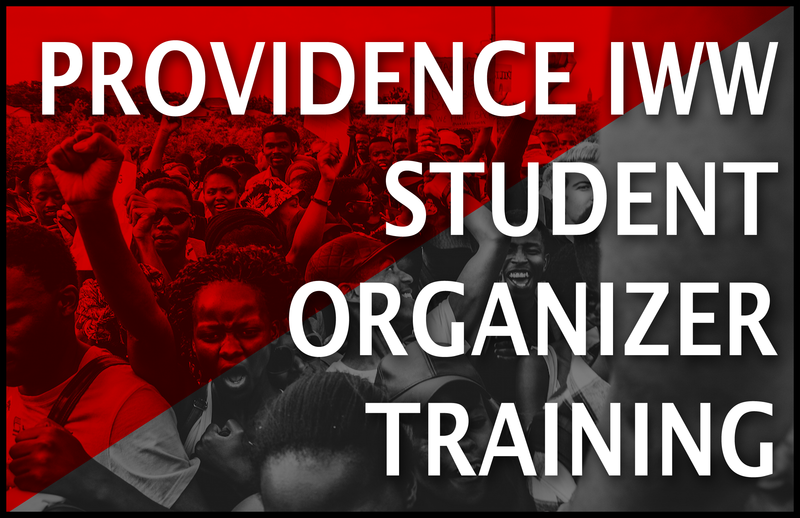 We will be hosting our student organizer training during the weekend of January 7th and 8th from 11-5PM. 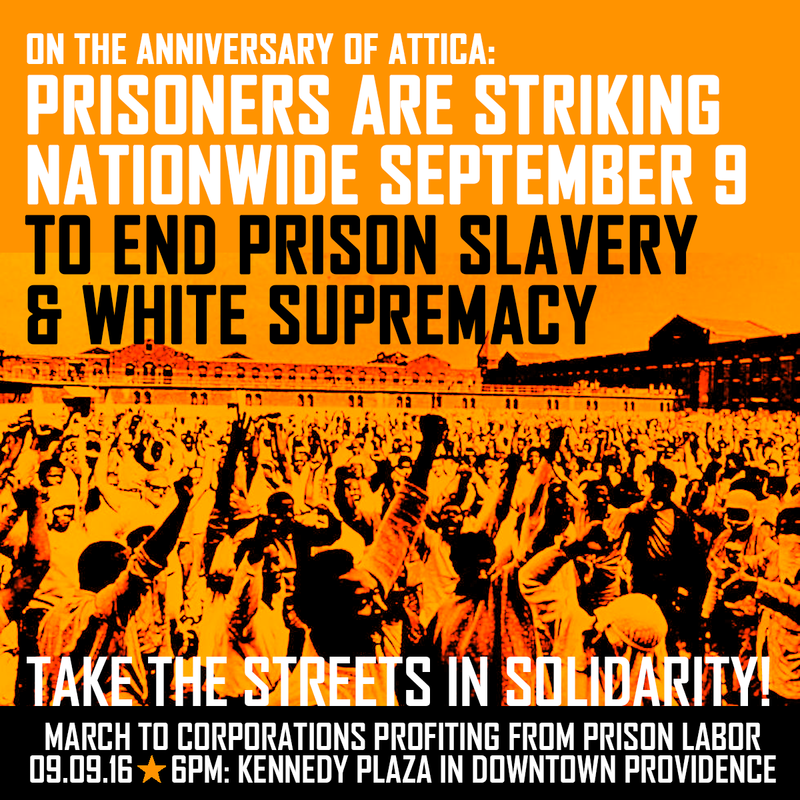 ON FRIDAY, SEPTEMBER 9TH, we are calling on people across Rhode Island to converge in Downtown Providence to hold a rally and march in solidarity with the US-wide prisoner work-strike against prison slavery. Slavery is legal in America. Written into the 13th Amendment, it is legal to work someone that is incarcerated for free or almost free. Since the civil war, tens of millions of people – most arrested for non-violent offenses – have been used as slaves for the sake of generating massive profits for multi-national corporations and the US government. Today, prison labor is a multi-billion dollar industry which helps generate enormous wealth for key industries such as fossil fuels, fast food, telecommunications, technology, the US military, and everyday house hold products. This is not just a prison strike for better wages or conditions, it is a strike against white supremacy, capitalism, and slavery itself. Bring banners, signs, noise makers, friends, co-workers, neighbors, family members, and more! Gather at Kennedy Plaza at 6pm. Come learn the basic skills needed to start building power with your classmates at your school and in your communities! Food and refreshments will be provided. Funds will be available to reimburse attendees who are traveling by bus (up to $6). If you are planning on attending, please register at the following link: http://bit.ly/29npt0I. Gathering this information will help us better plan for the training ie. ordering the appropriate amount of food, printing supplies, etc. We’re having another letter writing night! Invite your friends, family, co-workers, comrades, and neighbors! Do you have friends or family locked up, or have you been locked up yourself? Join us for a discussion of prison organizing happening now across the country. Learn how you can support the work and get involved with the newly formed Providence chapter of the IWW Incarcerated Workers Organizing Committee. We’re going to be writing letters to members on the inside across the nation and reaching out to incarcerated workers in the New England and broader North Eastern region. IWOC supports prisoners who are organizing inside prisons, and builds bridges between them and communities on the outside. In recent years, the group has published a newsletter for incarcerated people, mobilized support campaigns for individuals targeted with solitary confinement and abuse by guards, and helped coordinate actions across multiple prisons. IWOC is a committee of the Industrial Workers of the World, a union for workers of any race, gender, nationality or workplace willing to fight together for better lives, and against the capitalist, racist, patriarchal system as a whole.